Two days and no replies? Is it that unremarkable? I can see a lot of stuff I get, and a lot that I don't. For example, why is /m/ a W? /S/ an alpha? /f/ a lowercase delta? 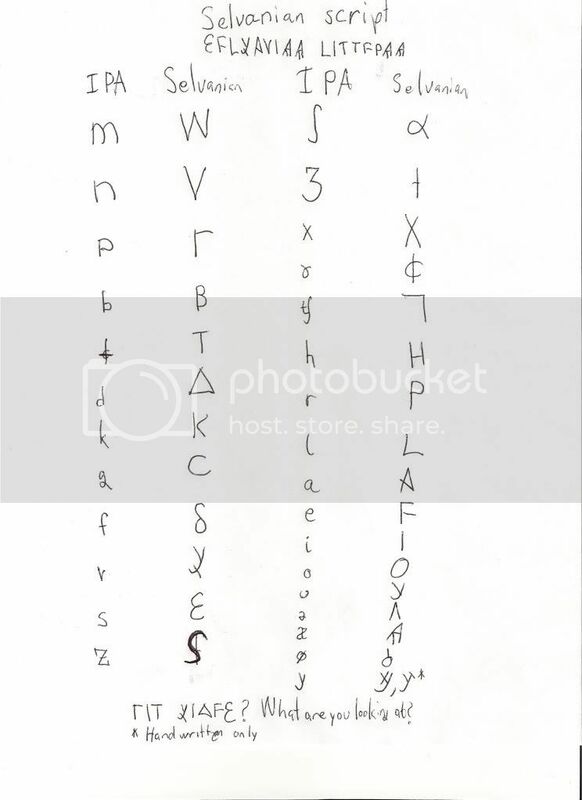 /m/ is like a W because it comes from this Etruscan letter. /S/ comes from this, and f comes from this. Awesome. I can see those. Sorry; I've seen and admired it several times, but am just now getting around to posting about it. It looks very believable. If you look up a modern alphabet in some dictionary or encyclopedia you'll find an illustration that resembles yours. Can I assume this is for a "lost languages" or "lost history" type of conlang, rather than a completely alien culture or a completely alternative history? BTW I can't display .svg files; or at least I don't know which of the software here should try it. Can anyone tell me?